Structural characteristics of limb bones provide insight into how an animal dynamically loads its limbs during life. Cause-and-effect relationships between loading and the osteogenic response it elicits are complex. In spite of such complexities, cross-sectional geometric properties can be useful indicators of locomotor repertoires. 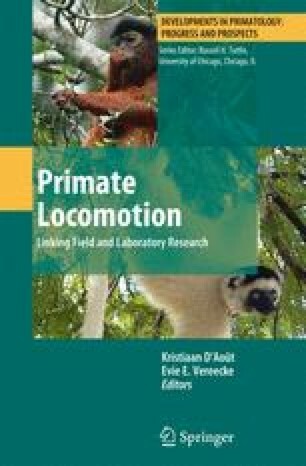 Typical comparisons use primates that are distinguished by broad habitual locomotor differences, usually with samples garnered from several museum collections. Intraspecific variability is difficult to investigate in such samples because knowledge of their behavior or life histories, which are tools for interpreting intraspecific variability, is limited. Clearly, intraspecific variation both in morphology and behavior/life history exists. Here we expand an ongoing effort toward understanding intraspecific variation in limb structural properties by comparing free-ranging chimpanzees that have associated behavioral and life history data. Humeral and femoral data from 11 adult chimpanzees (Pan troglodytes) of Kibale National Park (Uganda) are compared to 29 adult chimpanzees from Gombe (Tanzania), Mahale Mountains (Tanzania), and Taï Forest (Côte d’Ivoire) National Park communities. Overall, limb structural morphology of Kibale chimpanzees most resembles limb structural morphology of Mahale chimpanzees. Shape ratios and percentage cortical areas of Kibale chimpanzees are most similar to non-Gombe chimpanzees, while Kibale structural properties, e.g., maximum rigidity, are most similar to non-Taï structural properties. Even after adding Kibale females, Taï females continue to stand out from females in other communities.